Though Gamescom was filled with a few press conferences, other trailers were showcased at the event away from the expensive cameras and massive stages. The games shown outside of press conferences were arguably more impressive than what was showed on stage, and many of these trailers serve as a final teases of what's to come rather shortly. So, in a bid to not let you pass by any of these awesome upcoming games, here's a final rundown of the Gamescom trailers/gameplay you might not have seen. After starting the legendary series back in 1987, Hideo Kojima's final Metal Gear Solid game is almost upon us. Though he was recently shat on by Konami and literally cast aside, his final masterpiece looks like it's still intact. For many of us this is the end to a very long road, but it certainly looks like one that's worth taking. Featuring an open-world like nothing we've seen before, classic Metal Gear Solid game mechanics re-jigged for a new generation and core gameplay that looks truly astounding, I think Kojima may finally better his current masterpiece, Metal Gear Solid 3: Snake Eater. My body is ready. Some gamers enjoy punishment, and when it comes to punishment Dark Souls 3 is the granddaddy of pain. The new game, much like Dark Souls 2 and Dark Souls before that, blends the beautiful with the monstrous to a near perfect effect. Despite the world being a truly dark place, it's one that I'm already dying to get back into. Though it's hard to say what it has changed since Dark Souls 2 (and possibly learned from Bloodborne), it at least retains the mood and atmosphere that us Dark Souls fans crave. 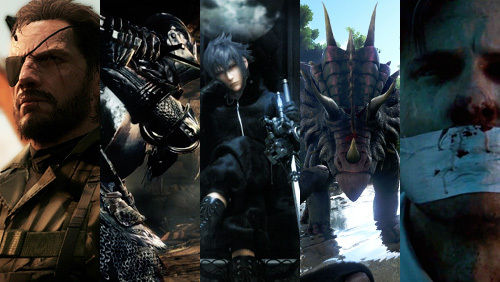 It seems like we've been waiting forever for Final Fantasy XV, but there isn't much longer to wait now. After playing the demo on the Playstation 4 not too long ago, I was blown away by how the Final Fantasy series so easily gelled with the open-world genre. This latest short chunk of gameplay reveals the return of the classic Final Fantasy foe, the Malboro; the toxic green plant that is best avoided. I guess no one told these guys though, as the Malboro literally kicks their asses. 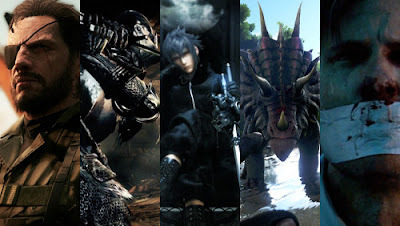 My hype levels couldn't be high enough for Final Fantasy XV. Does anyone remember B.C, the cancelled Xbox game from way back when? Google it. Since its demise I've always wanted something that looked like it used B.C as a jumping off point. Perhaps the developers will disagree with me here, but ARK: Survival Evolved looks to be directly, or indirectly, influenced by B.C. It's a open-world survival game that gives you the chance to explore a vast and diverse world, build your own structures, plant and grow crops, tame and ride dinosaurs and use a whole array of customized weapons. It looks like if B.C and Minecraft had a baby, and though it certainly won't get the attention as the other games on our list, it's a game I'm dying to play. Bring it on. Since playing the first game yonks ago on the PC, I've been a pretty big fan of this series. Though I don't think Mafia 2 reached the heights that the original did, it was a fun game that resurrected a series I thought was long dead. Now, after 5 years since Mafia 2 was released, Mafia 3 has been announced. This time taking place in New Orleans in the late 60's, Mafia 3 puts you in the shoes of Lincoln Clay, a Vietnam veteran, with the mafia themselves being the antagonists directly from the outset. With a few people by his side to help including Mafia 2 protagonist Vito Scaletta, Lincoln wants to take back his city from the ever growing mafia presence that is slowly corrupting everything.